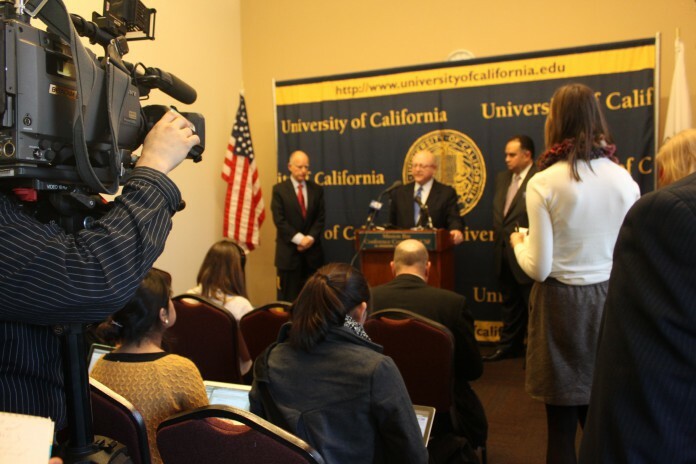 In line with his promise to increase state funding for the University of California if Proposition 30 passed, Gov. Jerry Brown’s initial California State budget includes a $141.725 million increase to UC’s operating budget for 2013-2014. While the Board of Regents expressed sincere gratitude to the governor for following through with his promise, many still recognized the large gap in state funding when compared to previous years and the need for continued support to reach those previous levels. “This truly is a budget that provides some relief for the university,” said Vice President for Budget Patrick Lenz, who was the first to introduce the university’s plan to restructure lease revenue debt as the major goal on which the Committee on Finance is focusing to save the university more money. A 6 percent tuition increase in the 2013-2014 university budget is tentatively planned, if the debt restructuring on the part of UC and an increase in state funding is not provided in the governor’s budget for next year. While restructuring the lease revenue debt was the committee’s main presentation point to the Regents, discussions quickly turned to the issue of state divestment from UC and their continued lack of support for over 23,000 students whose education is being paid for entirely by UC. Brostrom also pointed out that University of California now has state funding levels that match those from 1997-1998, but is educating 75,000 more students and has still seen a 60 percent funding drop since 1990. “We need to get help from the state and they need to pay for the students, otherwise we’re just selling assets and we’re going broke,” said Regent Hadi Makarechian. California State Assembly Speaker John A. Perez, in attendance along with Gov. Brown and Lt. Gov. Gavin Newsom, cautioned the Regents to be more introspective of how they compensate high earning individuals, and to watch how they discuss state support because of the 38 newly elected California State Assembly members, who do not have as much experience dealing with California’s budget processes and UC expectations. He also critiqued the Board of Regents on what he saw was their focus on one solution for a problem that might have many solutions. “Now with stability [because of the passage of Proposition 30] we can look at ways to innovate, to not just survive but soar,” Speaker Perez said. Brown also critiqued the Board of Regents on the same issue, citing that though they do have less money from the state than in recent years, they have also played a part in the university’s current financial issues. Brown noted that retirement costs, building costs, and costs for security are all costs of doing business, and pointed out the Regents’ past decisions to increase tuition before looking at other alternatives to save money. Some alternative solutions for the budget issue that the governor proposed were to decrease instruction costs while maintaing education quality, reduce the amount of time it takes to get a degree at a UC, and to give the public a greater understanding of the exact cost of undergraduate and graduate educations at a UC campus.